DEFEND Temporary Crown and Bridge Material 76gm Cartridge with tips - A1 by DEFEND at Dental Training for Missions. MPN: CB-9000. Hurry! Limited time offer. Offer valid only while supplies last. Temporary Crown and Bridge Material DEFEND Temporary Crown & Bridge is a syringeable bis-acryl composite for chairside provisional restorations. View More In Cosmetics & Restoratives. Temporary Crown and Bridge Material DEFEND Temporary Crown & Bridge is a syringeable bis-acryl composite for chairside provisional restorations. 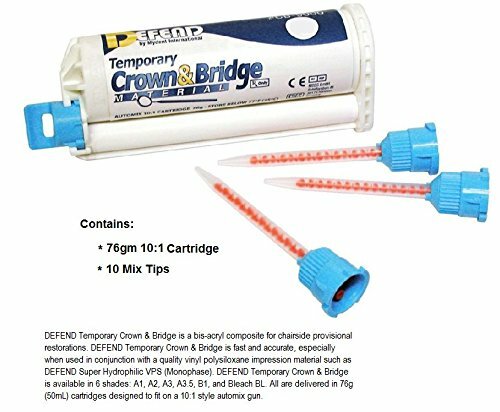 DEFEND Temporary Crown & Bridge is fast and accurate, especially when used in conjunction with a quality vinyl polysiloxane impression material such as DEFEND Super Hydrophilic VPS (Monophase). DEFEND Temporary Crown & Bridge is available in 6 shades: A1, A2, A3, A3.5, B1, and Bleach BL. All are delivered in 76g (50mL) cartridges designed to fit on a 10:1 style automix gun.